Archives, Museums, and Literary Festivals Celebrate Williams Centennial. Oh, Laura, Laura, I tried to leave you behind me, but I am more faithful than I intended to be ! I reach for a cigarette, I cross the street, I run into the movies or a bar, I buy a drink, I speak to the nearest stranger -anything that can blow your candles out ! --Last lines of The Glass Menagerie by Tennessee Williams. Had he not choked to death on the plastic cap from a bottle of baby aspirin, Thomas Lanier Williams would have celebrated his 100th birthday in 2011. His accidental death was the end of a decades-long slide into depression, alcoholism, and addiction, for one of America's three great playwrights of the 20th century. (The others being Eugene O'Neill and Arthur Miller.) But Williams's legacy is secure, with his best plays constantly revived, and even his lesser-known, late works inspiring new productions as their Gothic, black comic sensibility is discovered to be oddly well-suited for the 21st century stage. And along with theater companies around the globe, archives, libraries, and literary societies with ties to Williams are also pulling out all the stops to mark what has been called "The Tennenniel." During A 1973 Visit to The Ransom Center. The Harry Ransom Center of the University of Texas at Austin is presenting Becoming Tennessee Williams from February 1, 2011 - July 31, 2011. This centenary exhibition draws on the Ransom Center's extensive collection of Tennessee Williams manuscripts, correspondence, photographs, and artwork to illuminate the process by which Thomas Lanier Williams became Tennessee Williams. "There is no more influential 20th-century American playwright than Tennessee Williams," said Charlotte Canning, curator of the exhibition and professor in the Department of Theater and Dance at Austin. "He inspired future generations of writers as diverse as Suzan-Lori Parks, Tony Kushner, David Mamet and John Waters, and his plays remain among the most produced in the world." 1994 United States Postal Service Stamp Honoring Williams. The exhibition is drawn from the Ransom Center's collection of Williams material, which is one of the primary archives of his works. The Center acquired Williams's own papers between 1962 and 1969. That collection documents his career thoroughly, especially his plays The Glass Menagerie and A Streetcar Named Desire, and includes more than 1,000 separately titled plays, short stories and poems, correspondence, and newspaper clippings. The collection expanded in 1964 when the Ransom Center purchased the correspondence between Williams and his longtime literary agent, Audrey Wood. In 1965, the Center also acquired the Williams family papers from his mother, Edwina Estelle Dakin Williams, along with other important manuscripts from then-Gotham Book Mart owner Andreas Brown. 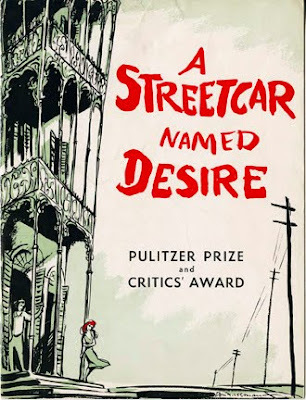 The Center continues to build the Williams collection and recently purchased an extensively revised first-draft screenplay of A Streetcar Named Desire. "These rich holdings at the Ransom Center allow us to better understand how these extraordinary works came into being," said Canning. 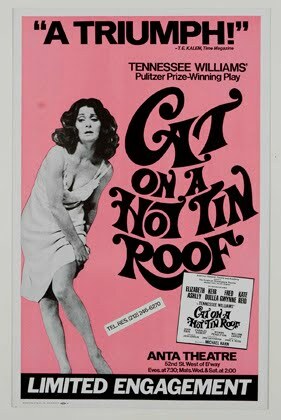 "Glass Menagerie, Streetcar and Cat on a Hot Tin Roof are just a few of the masterpieces the exhibit follows from early drafts to full-fledged productions. We believe visitors will find themselves as much in awe of Williams as we are." 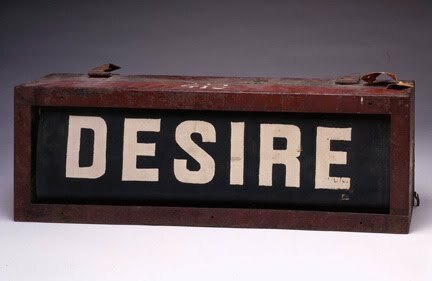 Desire Streetcar Sign Box, ca. 1935. 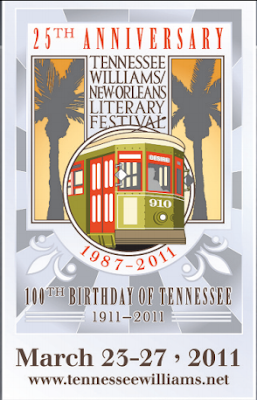 Meanwhile, Williams's adopted hometown of New Orleans, setting for perhaps his greatest work, A Streetcar Named Desire, celebrates his 100th birthday with both an art exhibit and a literary festival. 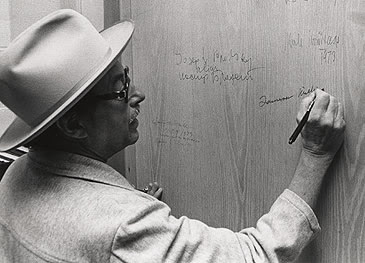 The Historic New Orleans Collection(THNOC) and the Al Hirschfeld Foundation have collaborated to present Drawn to Life: Al Hirschfeld and the Theater of Tennessee Williams. The exhibition and its companion catalog bring together highlights from the collection’s permanent holdings and dozens of drawings by the legendary artist. 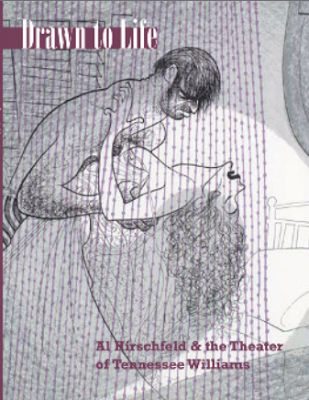 Hirschfeld was the foremost artistic chronicler of Williams’s productions on and off Broadway for six decades. His drawings create a virtual archive of the playwright’s career, effectively capturing the essence of the superb performances of the magnificent actors who portrayed his characters on stage and screen. From Marlon Brando, to Elizabeth Ashley, to Richard Burton, to Katharine Hepburn, to Bette Davis, to Uta Hagen, to Jessica Tandy, all are instantly recognizable here, demonstrating their own brilliance through Williams's immense gallery of great theatrical roles. The Big Easy will also be celebrating its favorite adopted son at the 25th Annual Tennessee Williams/New Orleans Literary Festival. This five-day fete, March 23-27, truly covers the waterfront, honoring Williams with acting master classes, panel discussions, a scholars' conference, comedy improv, a poetry slam, an erotica reading, writing competitions, a breakfast book club, French Quarter literary walking tours, a book fair, and even a "Stanley and Stella Shouting Contest." Theatrical and literary luminaries scheduled to appear include Carroll Baker, Shirley Knight, Grace Zabriskie, Zoe Caldwell, Armistead Maupin, Robert Olen Butler, John Waters, Rex Reed, Winston Groom, and Dorothy Allison. A Streetcar Named Desire, 1948. 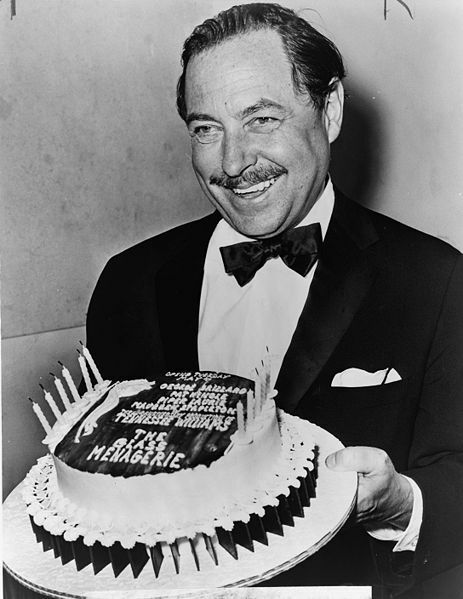 The many celebrations and theatrical revivals marking the centennial of Tennessee Williams are a reminder of the timelessness of his writings. As Williams once remarked to his literary agent: "I have only one major theme for my work which is the destructive impact of society on the non-conformist individual." That theme resonates more and more as technology continues to make the world less personal. As they steadfastly cling to their defining idiosyncrasies, Williams' characters are standard-bearers for the artistic temperament. Perhaps his greatest creation, Blanche DuBois, says it best "I don't want realism. I want magic. I try to give that to people. I misrepresent things to them. I don't tell truth, I tell what ought to be truth."